Growing up surrounded by local farms on eastern Long Island, NY, I learned at an early age the importance of eating organic. While attending the Ross School in East Hampton, NY, I enjoyed working on the school farm, where I had a chance to plant and harvest organic fruits and vegetables, which would later be served to the school’s faculty and students in the organic-only cafe. Through these experiences, I realized that organic food and beverages were not only beneficial to society’s health but also to the environment. But when I went to college, I was surprised to discover that organic food and beverages were not the norm and were not readily available in NYC or, more broadly, nationwide. Recognizing the importance of organics and non-GMOs, I began to work rigorously to promote education and awareness about these topics. Two years ago in my country kitchen, my family and I started to experiment with creating various organic drinks using the best ingredients. We loved trying the new concoctions, which we called “Hottie Totties.” We loved them so much that we decided to start an organic beverage company so we could share the drinks with everyone. Today, I am excited to introduce Hottie Tottie, a line of delicious, versatile organic juices, teas, and mixers that I'm sure will make a positive impact on the health of society and on the environment. Switzerland is one of my favorite places in the world, so of course, I was so excited to visit this December. We stayed in Zurich for a few days and had a fantastic welcome from the Baur au Lac. A few years ago, I interviewed the Baur au Lac's Gigi Kracht for Fairweather's inaugural edition and it was lovely to return to this incredible hotel. Zurich is magical, especially in the winter with the Swarovski crystals hanging above the streets and the fantastic markets, including delicious chocolates and handcrafted items. Next, we were off to St. Moritz. It is so beautiful there. It is hard to believe how serene and breathtaking it is. It is fun to walk around the town, which is filled with great shops and art galleries. I didn't get a chance to go skiing or hiking this time, but there are also great outdoor activities that I love to do when I'm there. It was an amazing trip and I can't wait to return. It was so much fun exploring the Royal Botanic Gardens with the Gagosian Gallery team in Scotland. The John Chamberlain exhibition at Inverleith House looks incredible. It was amazing to explore Capri. I've included a few of my favorite photos from my recent trip. After taking a boat to the island, we stopped by Il Riccio for lunch. Next we walked around town and visited the Capri Palace. We also found a fantastic place to get custom sandals made and were surprised to find Fairweather Magazine on the walls of the shop right next to a photo of Jackie Kennedy Onassis. At the end of the day, we enjoyed limoncello and Italian desserts with new friends before heading back to Positano. The name "Mr. Chow" evokes images of celebrities and power players flocking to Michael Chow's storied restaurants. But Chow was always an artist, and we visit him in his studio to view his extraordinary paintings and learn how his remarkable life story has shaped his art. Subscribe or download our App to read my interview with the legendary, Mr. Chow. I'm excited to present you with our highly anticipated Summer 2015 Edition. Highlights include interviews with world-renowned artist, Cai-Guo Qiang, celebrity restaurateur and artist Michael Chow, architect Patrick Tighe, former CEO of Ford Models and founder of Freedom for All, Katie Ford, director of Art Basel Hong Kong, Adeline Ooi, jewelry designer, Siena Lasker and former CEO of Marvel and Chairman of Valiant, Peter Cuneo. 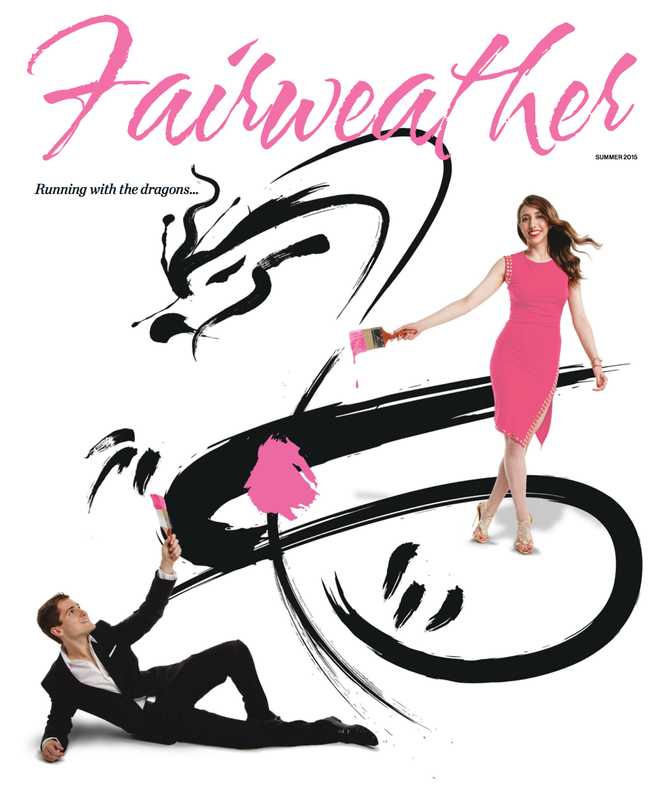 To read the incredible edition, download our App or subscribe to get Fairweather delivered to your door. I loved dropping by the studio of Cai Guo-Qiang to discuss the renowned Chinese artist's work, the real and unseen worlds, Chinese tales, creation and destruction, the environment...and extraterrestrials. To read the inspirational feature, download our App or subscribe. Staying at Cap Rocat, a former military fortress located in a secluded area of the bay of Palma de Mallorca. It is stunning. And the spectacular picnic style for breakfast is amazing...it is the perfect way to start the day. I will definitely return.